Carver is an enhanced carving tool similar to the Carve tool in Valve's Hammer Editor--but far more advanced. This tool allows you to use one or more cutter objects to carve into one or more other objects. Unlike the Boolean functions in Max (ProBoolean) this will create multiple independent blocks or sealed elements. If the original block is convex, all pieces will be convex as well. 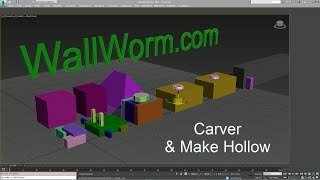 You can carve multiple objects or make hollowed objects. Minor updates and 3ds Max 2019 support.